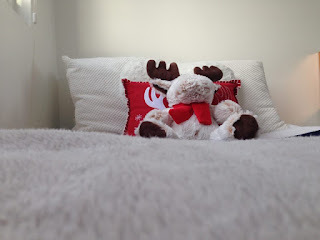 The other day I went out and bought a few Christmas themed items for my bed. I wanted it to look super cosy and festive, whilst still looking cute and well put together. Here is what I got, with them all already on my bed. The first grey throw is also from Primark, but I've had this for a while and I keep it on my bed all year round. The second reindeer throw is from Primark. I think this is so cute and instantly adds so much festivity to the bed. The red dots match the cushion, which is again from Primark. These two items go together so well. 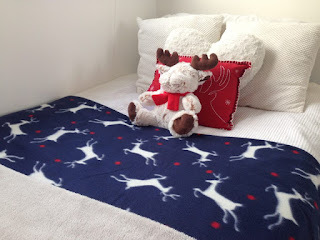 I wanted to have mainly red and white for my bedroom's Christmas theme, but I feel as if the blue really ties everything together, whilst red is still the accent colour. The throw was £3.50 and the cushion was £3. The last Christmas themed item I have on my bed is this fluffy reindeer. I don't know where this is from as my mum bought it me, but if I do find out I will let you know. It is super soft and so snuggly, I do really love it! It also matches the reindeer's on my throw and cushion. 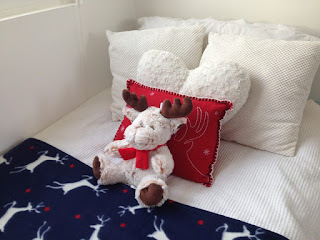 I hope you liked this little Christmas themed bed tour. If that is even a thing! I really like all the things I got and because they are from Primark they are super affordable!